A Sunnyvale man is among those injured in Tuesday's big earthquake and shares his story of survival with us. KATHMANDU, Nepal -- A 7.3 earthquake brought a new wave of fear and death to Nepal. Earthquake experts call it the largest aftershock since April's earthquake. The death toll is at 82. And a U.S. Military helicopter from Camp Pendleton remains missing in Nepal. Although the Department Of Defense says there is no sign of a crash. ABC7 News reporter Sergio Quintana is the only Bay Area reporter in Nepal. He was there when Tuesday's quake hit and showed us the aftermath. 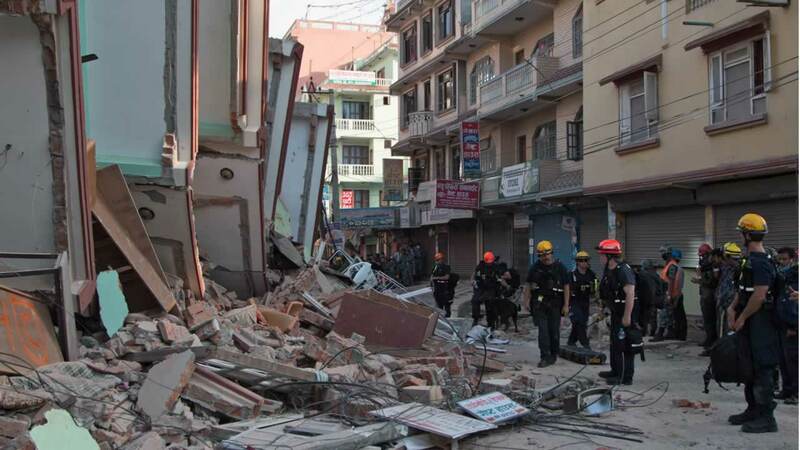 Some buildings already weakened by the massive earthquake from two weeks ago completely fell over or were destroyed. Seconds after the quake, people spilled into the streets by the thousands -- all of them clearly rattled by the 7.3 magnitude event. The Thamel District of Katmandu immediately closed for business. Around the city more buildings reduced to rubble. And as night came, the streets were empty, making plenty of room for emergency vehicles to get through and assist people with injuries from the quake. A major earthquake hit a remote mountain region of Nepal on Tuesday, killing at least 42 people, triggering landslides and toppling buildings less than three weeks after the Himalayan nation was ravaged by its worst quake in decades. Among those injured was Bishow Bhatta. He lives in Sunnyvale and also runs an orphanage in Nepal. After the first major earthquake in April, he traveled to the orphanage to help out. When the 7.3 earthquake hit, he shuttled all of the orphans under his care from their second floor work space. When it was time for him to leave, he was stuck and noticed the building next to him starting to shake, and jumped from the second floor. He says it was about 22 feet high. He broke his arm and leg and will have to have surgery. "I did not think about me or staff or anybody or my family, I just [thought] about the children inside the building. I [didn't] want them [trapped]," Bhatta said. He said he thought he was going to jump onto grass and ended up falling down on a concrete slab. None of the children in the orphanage were hurt. When Bhatta was on the ground, near the building, the children and some of the volunteers helped move him to safety and took him to the hospital. After this second major quake there is more rubble, more homes destroyed and more uncertainty about being home. People have pulled out their tents again and are sleeping in the streets, afraid to have their homes collapse on top of them. 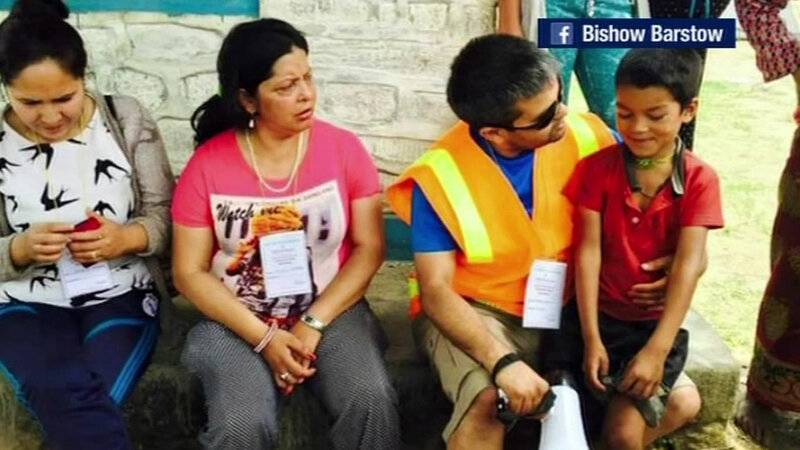 A Sunnyvale man in Nepal, Bishow Bhatta, was injured in the 7.3 earthquake when he was helping children escape an orphanage. Bhatta has been in Nepal for the past 10 days helping at an orphanage with others distributing food and goods. In 2002, the 40-year-old cab driver founded an organization to help an orphanage in a village in Kathmandu. Bhatta's wife, Deepa Bhatta, encouraged her husband to fly to his native Nepal following the first earthquake. "I said, 'Go, this time you have to go and help the people,'" Deepa said. Deepa told ABC7 News her husband has always been a giving person. "He tried to save the kids. Half of them were playing outside the building and half of them were inside and he tried to help everyone escape," Deepa said. Deepa and their two children, ages 13 and 15, haven't slept much after knowing he was injured. In the meantime, she says she won't rest until he is back. She hopes he gets well and comes back soon. The relief and recovery efforts in Nepal will likely need even more help now. If you would like to donate, you can text NEPAL to 90999 to contribute $10 or call 1-800-RED-CROSS. ABC7 News reporter Sergio Quintana is in Nepal. You can see his Twitter updates here.